George Ephraim Spiers (Senior) was a waterman in Tewkesbury, who moved to Gloucester, where he took up employment as a porter in the docks. Little did he realise that he was starting a Gloucester rugby dynasty. He had three sons, all born in Tewkesbury – George Ephraim (Junior) in 1875, William in 1876, and Tom in 1880. All 3 sons played for Gloucester. George Spiers, first employed as a groom, but later as a labourer, at Gloucester docks, played 16 matches for Gloucester “A” in 1894-95, but was never selected for the first team. Bill played regularly for Gloucester in 1895-96, when he made 13 appearances for the first XV, and at least 8 for the “A” team. His first points for the Club came from the conversion of a try scored by Bartlett for Gloucester “A” in their first match of the season – a 5-5 draw with St Catherine’s at Kingsholm on 28th September 1895. Bill had a baptism of fire for the 1st XV, playing his first game away at Cardiff on 12th October 1895, Gloucester going down narrowly 3-5. He scored his first try on 25th January 1896 in the 8-3 victory over Old Edwardians in Birmingham. In 1896-97, Bill played in 22 of Gloucester’s fixtures, the first of 4 successful seasons under the captaincy of Walter Taylor. He was also selected for the County, playing for Gloucestershire against Midland Counties at Moseley on 28th October 1896, and against Surrey at Richmond on 24th February 1897. Bill did not score any tries that season, but he did kick the only conversion of his career for the First XV in the 11-3 victory over Stroud at Kingsholm on 20th March 1897. During the summer of 1897, Bill moved to Plymouth, where he signed up to play for Devonport Albion the following season. The Devonport club were in serious trouble at the time, having signed and played four Welsh players, Jones and Rees Lewis from Aberavon and Davies and Griffiths from Llanelly, without gaining permission from the Welsh Rugby Union. Jones and Rees Lewis were declared professional and subsequently went north to play rugby league with Rochdale Hornets; Davies and Griffiths were initially suspended and later also declared professionals. T Hughes (Barry), W Sims (Morriston) and four other Welsh players were refused transfers to Devonport Albion. The press concluded that Devonport Albion were offering inducements to players to leave their clubs and sign up for the Albion, and that the RFU would therefore be forced either to suspend Devonport Albion or to ostracise all Welsh clubs “to the detriment if not the destruction of the game in Gloucestershire and Somerset”. Neither happened, and it was never proved that Bill Spiers had accepted any payment to transfer from Gloucester, and he went on to have a sparkling career for Devonport Albion and Devon. Within three months of starting to play for Devonport Albion, Bill was selected to play for Devon against Somerset on 11th December 1897 at Exeter. He played several more games for Devon before, on 11th January 1899, he found himself facing his home county Gloucestershire in the South West Group play off at Bristol, which Devon won and went on to beat Kent in the South of England Championship on 15th February 1899. Ten days later Bill played for the South v the North in the Final England Trial at Newcastle, where he found himself playing alongside his former Gloucester colleagues, Frank and Percy Stout and Fred Goulding. Although the South won by a goal and 2 tries to nil, only the Stout brothers were selected for the England team to face Scotland two weeks later. Indeed this was the closest that Bill (and Fred Goulding) ever came to a coveted international cap. However, Bill enjoyed further success before the end of the season, when he was back at Newcastle playing in the Devon side which beat Northumberland in the County Championship Final. He also played for Devon when they reached the County Championship Final again the following season, but they lost to Durham at Exeter. Although there may have been talk of Bill receiving inducements to transfer to Devonport Albion, this seems to have caused no ill will within the Gloucester Club. Bill presumably made visits back to Gloucester to visit his family, and on 10th March 1900, just after his England trial and five days before he played for Devon against Middlesex, he turned out for Gloucester at Kingsholm against Newport, and scored the second and final try of his Gloucester career, but it was not enough to prevent Newport winning 8-5. Bill’s continuing trips back to Gloucester are demonstrated not only by his marriage to Mary from Didmarton in Gloucestershire in 1903 (they later had two sons), but also by his final appearance for Gloucester in the traditional Boxing Day fixture against Old Merchant Taylors on 26th December 1902, which Gloucester won 8-5. This brought Bill’s Gloucester career to a close – it had spanned 1895-1902, 37 appearances, 2 tries and 1 conversion, but he had made much more impact than these figures convey. 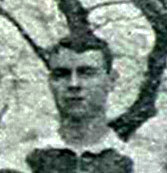 Tom was also a forward, and made 4 appearances for the “A” team in 1898-99. He played regularly for the “A” team in the 1899-1900 season with 20 appearances and 2 tries in the 24 fixtures, but he also stepped up to the 1st XV, playing in 3 matches and scoring his first try on his debut on 17th February 1900 in a 21-0 victory at Cheltenham. He was a regular for the first team in 1900-01, when he appeared in 29 of the 34 fixtures, and scored two tries at Kingsholm in a 34-3 win against Stroud on 3rd November 1900. This was a very successful season for Gloucester, with 24 wins and only 5 losses in their first season under the captaincy of George Romans. It was described as “A Season of Records” by WB, who maintained that “with the exception of Devon Albion (including Bill Spiers) – with whom Gloucester may fairly share the proud title of champion club in the English Union – no team has enjoyed a more successful season than the famous City combination”. He thought that “the team which represented Gloucester this season may well be regarded as one of the strongest all-round fifteens ever turned out by the Club”. For the first time since moving to Kingsholm, Gloucester went through the whole season undefeated at home – of 19 matches played, 17 were won and 2 drawn (Newport and Old Merchant Taylors). Of Tom himself, WB wrote: “T Spiers fully justified a permanent place in the team; he came to the front very rapidly, and his future is full of promise”. In the 1901-02 season, Tom made 20 appearances out of 34 fixtures, before injury cut his season short. He scored a try in the first game of the season against Clifton, and two more in the second match against Old Edwardians; later in the season he also score against Penycraig and Old Edwardians again. He made his county debut 10th October 1901 at Kingsholm, helping Gloucestershire beat Midland Counties 26-3, but was unable to break into the CountyChampionship side which made it through to the final. WB summarised his season as: “T Spiers did fine work up to the time he was injured”. Although Tom made 4 further appearances in 1902-03, his first team career ended on 14th April 1903 with a 26-0 win at Bath. He had made a total of 56 appearances for Gloucester and scored 8 tries. He continued to turn out for the “A” team, making at least 18 appearances in 1902-03 and at least 22 and 3 tries in 1903-04 (records are incomplete). George Ephraim (Junior) had two sons, Ernest born in 1904, and Sam born in 1909 – both played for the Club. Ernest played his first match for the 1st XV on 19th April 1927 against Cinderford, and his second and last also against Cinderford on 10th April 1928. Sam did not make it into the first team, but played for Gloucester United in the early 1930s, before following his uncle to Devonport, where he played for Devonport Albion, and against Gloucester on a couple of occasions. Jo is the great granddaughter of Tom Spiers, and a season ticket holder at Kingsholm; she works for BBC Radio Gloucestershire, and has broadcast programmes about Gloucester Rugby.